Where does one even begin to attempt to explain Yayoi Kusama? Her signature red wig and dotty clothing? Her associations with - but also lack of wholehearted attachment to - such wide-ranging 20th century art movements as Surrealism, Minimalism and Pop art? Or perhaps simply her position as one of the most singular figures of the postmodern avant-garde? We could talk about so many more things related to Kusama and her truly unique art, but before getting into all of that, let's run through some of her worldlier career achievements. Prizes and honours? She can lay claim to plenty of those. Try the likes of the 1967 Fourth Belgium International Short Film Prize; the 1982 Golden prize from the Italian Academy of Arts; and the Ordre des Arts et des Lettres in 2003. What about high-profile exhibitions at venues such as the Centro Cultural Banco de Brasil in Rio de Janeiro, Brazil; Tate Modern in London, England; and the Whitney Museum of American Art in New York, USA - all in the last few years alone? Kusama also enjoys a presence in the public collections of the Tate in the UK, the Centre Pompidou in France and the National Museum of Modern Art in Japan. However, none of these bald facts could ever illuminate Kusama, her art and her story quite as well as her own words. It's hardly an unheard-of story in the art world: the precocious youngster who discovered a creative path and found her journey down that path fiercely opposed by her restrained, orthodox family, only to break through those limits and conquer the world. Nonetheless, the backstory is perhaps a rather more serious one for Kusama, given her declaration that she would have committed suicide "a long time ago" were it not for art, so important an outlet of escapism did it prove from her very real personal challenges, particularly with regard to mental illness - the artist having even voluntarily made a Tokyo psychiatric asylum her home since 1977. Long before then, however, the much younger Kusama had dreams of an exciting wider world far beyond the restrictions of her upper-middle-class family of seedling merchants. Her mother's insistence on continually taking away her inks and canvases and forbidding her from painting only strengthened her resolve. Born in Japan's Matsumoto City in 1929, Kusama eventually got her way of pursuing an art career, studying at the Arts and Crafts School in Kyoto from 1948 to 1951. But, with New York City taking over from Paris as the focal point of the international art scene in the years after World War II, Kusama felt an overpowering urge to venture out of her native land, landing in Seattle, USA in 1957. That same year, she became a student at the Art Students' League in New York. To say that Kusama made a rapid impact in her new, decidedly more cosmopolitan surroundings would have been something of an understatement. It was thanks to a series of works that were so instrumental in her career they lent themselves to the name of her 2002 autobiography. The artist's early Infinity Net paintings - immense canvases up to 33 feet long, covered in small, thickly painted loops denoting infinity - attracted no less an admirer than Donald Judd, then an art critic but later a key guiding force behind Minimalism. The Missouri native described the effect of the paintings as "both complex and simple", and it seems that many others were similarly captivated by them, paying around $200 a piece for them at the time - and as much as $7.1 million now, to reference the record set at Christie's for White No. 8 in 2014. Those pieces, of course, owed much to Kusama's experiences of mental illness - in particular, the childhood hallucinations that first brought the motifs of dots and nets to her attention. But with the artist also becoming known from the late 1960s for a highly provocative style, explored through risque situational performances involving the painting of participants' bodies with polka dots, or dressing them in her own custom-made fashions, she wasn't afraid to extend her influence a long way from the Infinity Net paintings. From rubbing shoulders with Andy Warhol and becoming especially intimate with the reclusive Joseph Cornell, right through to influencing Claes Oldenburg and many other contemporaries, Kusama had certainly made her presence felt throughout the New York art scene by the time she decided to return to Japan in the early 1970s. It has been the foundation of her continuing success since, in the most staggering range of mediums - from drawing, painting, collage and printmaking to installation art, environmental art, literature and even fashion, a firm example of the latter being her celebrated collaboration with Louis Vuitton in 2012. 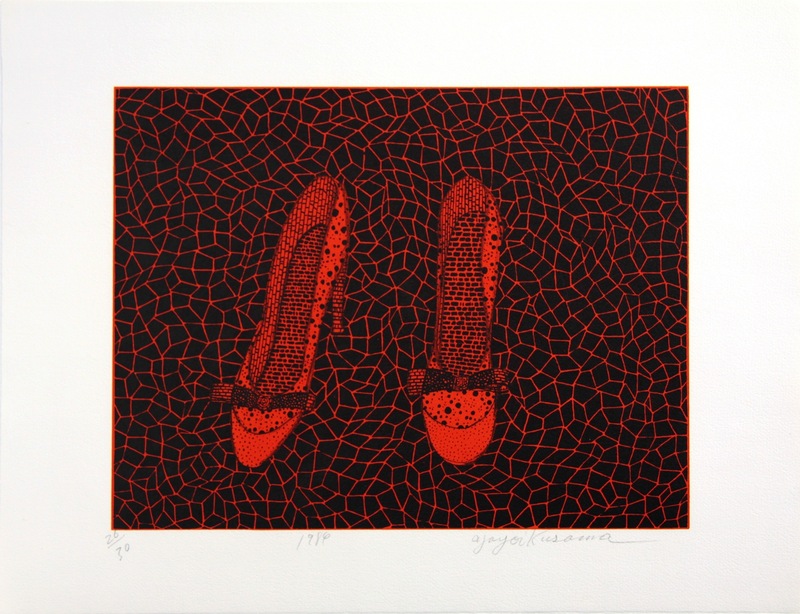 To this day, while still massively popular and instantly recognisable among casual art lovers and hardened commercial art world figures alike, Kusama remains a stubbornly difficult artist to sum up, and let's be honest - that's exactly how we like her. Polka dots really are fabulous!